CALL US NOW TO PLAN YOUR VACATION! When you think of vacationing in Mexico, you probably think of Cancun, the Riviera Maya, and Playa del Carmen. 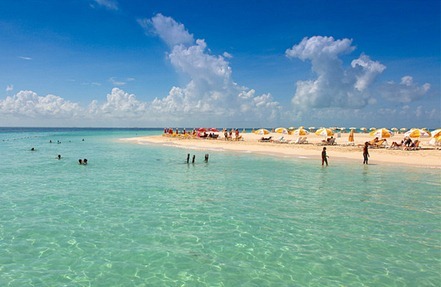 You may not be aware of the fact that the state of Quintana Roo is home to four islands as well. The sun shines brightly on these island paradises and reflects off of their white sand beaches, so island life tends to move slowly, as do its habitants. These islands range in size and population but are all rich with natural beauty, Mayan history and/or Mexican culture. Next time you are in the area, take a day (at least) to explore one or more of these laid back, relaxing island retreats. The largest and most populated of the four islands, Cozumel is located approximately 11 miles off the coastal town of Playa del Carmen. It is about 30 miles long and 10 miles wide. It is Mexico’s third largest island. 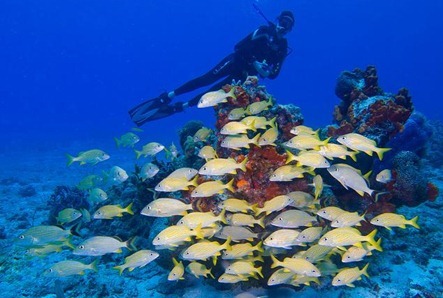 Cozumel is home to the second largest coral barrier reef in the world, and is a snorkel and dive mecca. The largest concentration of restaurants, bars and shopping is located in the downtown area of the city of San Miguel. Mayan people have inhabited Cozumel since 300 AD. The island has a rich history that includes Mayan worship of the goddess of fertility, a smallpox epidemic and pirates. Major airlines fly to Cozumel, cruises dock there, or you can take a ferry or air taxi. “The Island of the Women” is named for the many cult images of goddesses that the Spanish found when they discovered the island, a sanctuary dedicated to the Mayan goddess Ixchel, in the 16th century. Isla, as it is lovingly called by locals, is located 8 miles off the coast of Cancun and is only about 4 miles long and half a mile wide at its widest point. There are many charming hotels and restaurants that welcome visitors from all over the globe. You won’t find a lot of cars on Isla, but you will find scooters, bicycles and golf cars galore. Rent one and be your own tour guide. Then park at North Beach and have a cold one while you take a dip in the crystal blue water. You can take an air taxi or a ferry from the Cancun Hotel Zone or Puerto Juarez to get to Isla Mujeres. As we go down the list, these islands become less inhabited. Holbox is a true island refuge, where you won’t find ATMs or even cars! Most of the locals are fishermen, so imagine the fresh seafood that is available. There are many charming boutique hotels on the island. Tourism still hasn’t taken over Holbox, which means “Black Hole” in Maya, but it is quickly becoming a popular destination due to the hundreds of whale sharks that gather in the area each May-September. Visitors come from all over the globe to swim with these gentle giants. Visitors also love to kite boarding off the beaches of Holbox. You can get to Holbox by traveling by bus to the port of Chiquila and then taking a private boat or ferry, or by taking an air taxi. Nobody lives on Isla Contoy! Well, except for many birds and sea turtles. 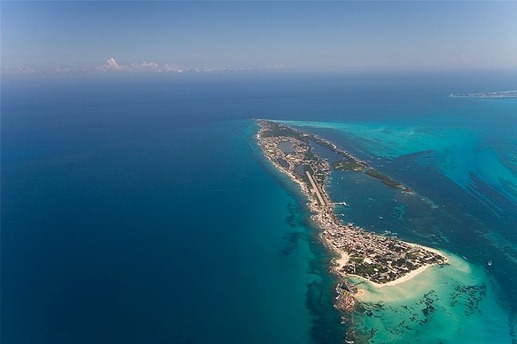 This island is located approximately 18 miles north of Isla Mujeres, where the Gulf of Mexico and the Caribbean Sea meet. It is only about 5 miles long and only about a tenth of a mile wide. It is considered the most important nesting place of sea birds in the entire Mexican Caribbean. 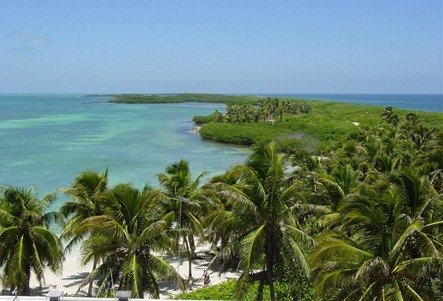 Isla Contoy is a Mexican national park and is protected. There are only a few tour providers who are allowed to bring visitors to the island and only 200 people may visit per day. There are no hotels on the island. There is only a visitor center. You can visit Isla Contoy by taking a tour or if you would like to visit in your own boat you must apply for permission at the park offices in Cancun or on Isla Mujeres. Kristin Busse is an American expat who has been living in Cancun, Mexico since 2001. A wife, mother, singer, salsa dancer and now writer, she has worked in many different industries but is currently enjoying exploring the Yucatan Peninsula and sharing her expertise and experience with readers around the world. Follow Kristin on Twitter. Great post Kristin. It is hard to believe that I have only seen one of these islands – “Isla” – and I loved every second of my time there. I think that renting a golf cart is a must. As a matter of fact, the ferry company and a golf-cart rental company should hook up and offer a combo-ticket, so you can arrive at the dock and jump onto your golf-cart. Another thing that I love about Isla Mujeres is Pita Amore – best pitas on the planet. 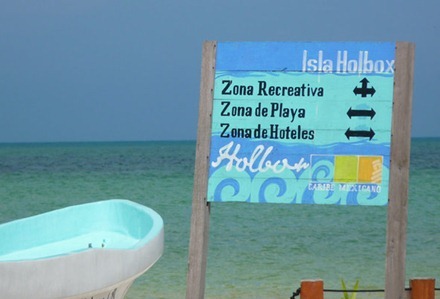 I can’t wait to go to Holbox in June. I love to fish, so I will fit right in with the locals. Follow us on Twitter, Like us on Facebook, Follow us on Pinterest, and watch us on Youtube. Subscribe to our newsletter and receive a FREE Cancun & Riviera Maya Travel Guide and discount coupon!